Dry Clean text: We realize that whether it be business, casual, formal or fancy, your wardrobe is an investment. At Quality Plus Cleaners, every garment undergoes a complete inspection before the dry cleaning process, assessing the correct method and technique needed to produce the finest results. Hems, buttons, shoulder pads and trimmings are inspected, reinforced and repaired when necessary. 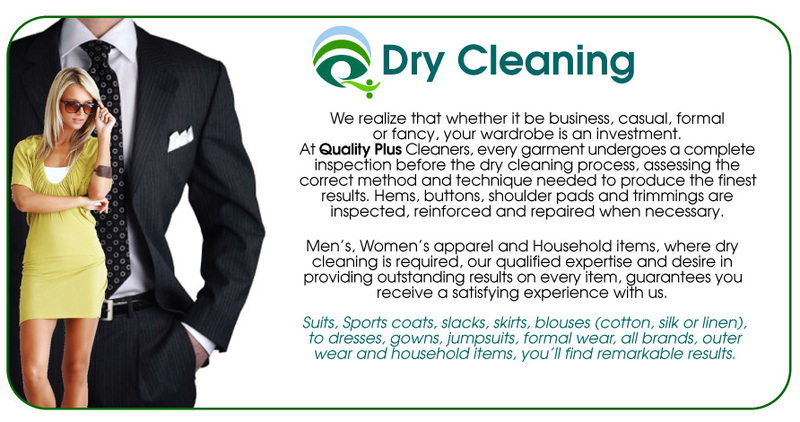 Men’s, Women’s apparel and Household items, where dry cleaning is required, our qualified expertise and desire in providing outstanding results on every item, guarantees you receive a satisfying experience with us. Suits, Sports coats, slacks, skirts, blouses (cotton, silk or linen), to dresses, gowns, jumpsuits, formal wear, all brands, outer wear and household items, you’ll find remarkable results. Shirt Laundry text: Cleaner, Brighter Shirts.... Every time. 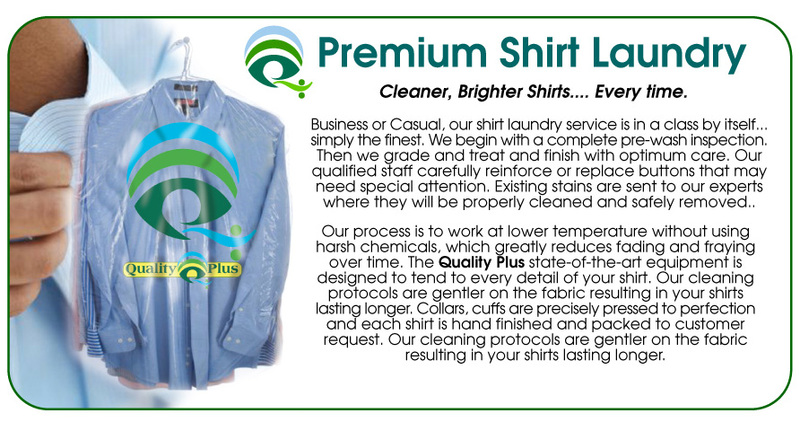 Business or Casual, our shirt laundry service is in a class by itself... simply the finest. We begin with a complete pre-wash inspection. Then we grade and treat and finish with optimum care. Our qualified staff carefully reinforce or replace buttons that may need special attention. 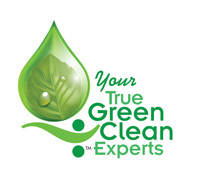 Existing stains are sent to our experts where they will be properly cleaned and safely removed. Our process is to work at lower temperature without using harsh chemicals, which greatly reduces fading and fraying over time. The Quality Plus state-of-the-art equipment is designed to tend to every detail of your shirt. Our cleaning protocols are gentler on the fabric resulting in your shirts lasting longer. Collars, cuffs are precisely pressed to perfection and each shirt is hand finished and packed to customer request. Our cleaning protocols are gentler on the fabric resulting in your shirts lasting longer. Suede -Leather text: No fabric has the appeal of top quality of leather or suede Sporty, casual or formal, Quality Plus can professionally clean your leather, suede or combination garments with suede or leather trim. We can finish and restore, repair rips and tears and replace worn/torn linings. 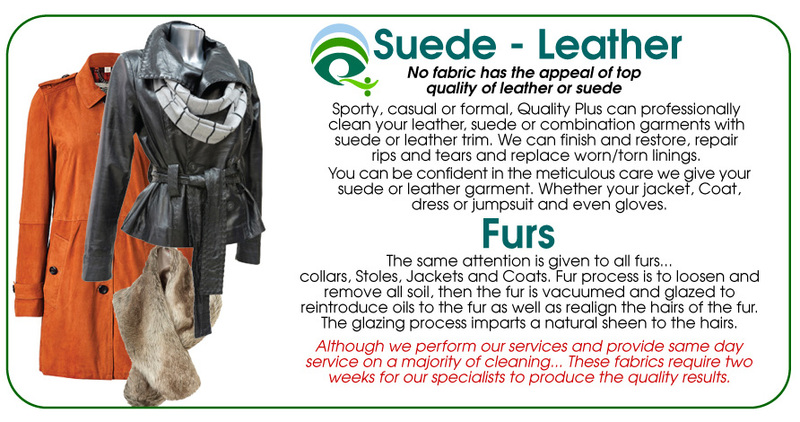 You can be confident in the meticulous care we give your suede or leather garment. Whether your jacket, Coat, dress or jumpsuit and even gloves. Fur text: The same attention is given to all furs, collars, Stoles, Jackets and Coats. Fur process is to loosen and remove all soil, then the fur is vacuumed and glazed to reintroduce oils to the fur as well as realign the hairs of the fur. The glazing process imparts a natural sheen to the hairs. Although we perform our services and provide same day service on a majority of cleaning... These fabrics require two weeks for our specialists to produce the quality results. ...................... Household text: Area Rugs, Drapery, Table, Bed & Bath Linens Quality Plus understands the substantial investments made in these household items. We offer complete and thorough cleaning and restoration as requested. These items require great care in laundering and cleaning. 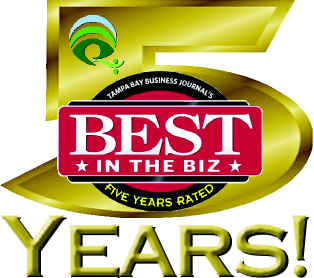 Quality Plus is equipped with state-of-the-art equipment to perform this delicate work. Cleaning and pressing linens as well as performing professional stain removal and gentile hand finishing. Cleaning of draperies, curtains and other window treatments, our experienced professionals who understand the many degrees of this specialty. In addition, our professional customer service representatives come to detach as well as re-hang your drapery. Call us for consultation and questions or concerns you may have. ....................... Tailoring text: Quality Plus offers the finest professional tailoring and alterations. Our experienced team of tailors and seamstresses specialize from minor alterations to major tailoring. You will find that our alterations staff is highly knowledgeable, considerate and attentive as they are provided with a complete line of state-of-the-art sewing equipment. Our highly trained staff also specializes in couture alterations, which includes extensive tailoring. Quality Plus alterations department is able to replace missing beads, sequins, and crystals to your garments. Our tailors are able to custom fit bridal gowns, alter suede, hem leather and hemming for denim jeans to preserve the design of the jeans. 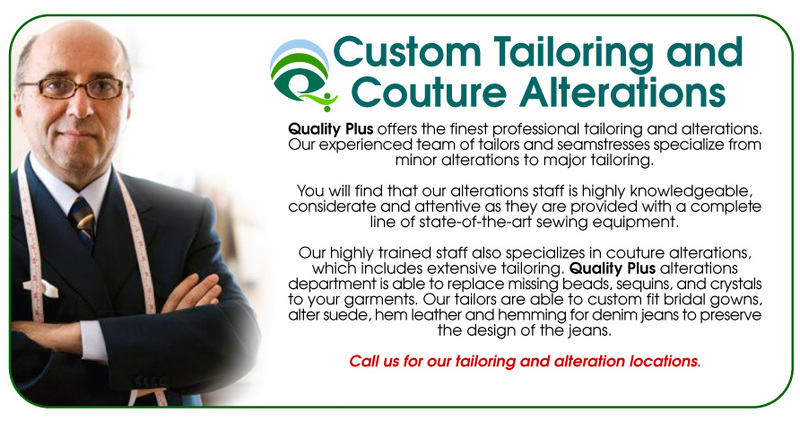 Call us for our tailoring and alteration locations. ..................... Wedding Gown text: Such a precious garment as one’s wedding gown or special formal wear deserves special care. Care that only a quality garment care cleaner like Quality Plus can provide. In order to achieve extraordinary results, we begin with a thorough inspection of your garment. 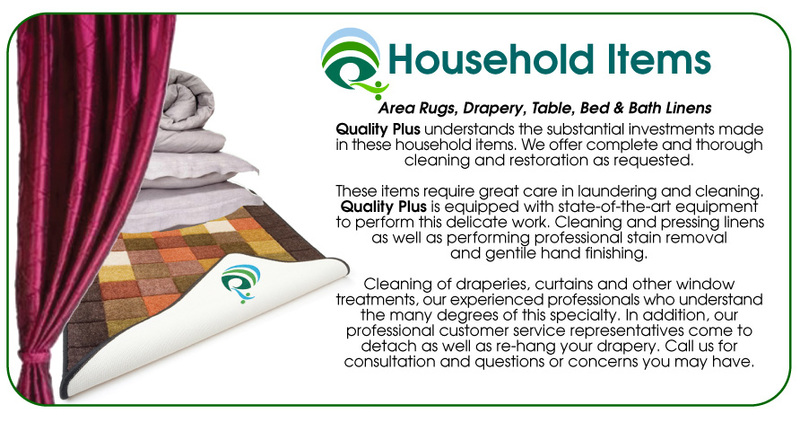 We meticulously review the fabric, seams and embroidering and then devise the ideal cleaning method based on years of experience. With Wedding or Bridesmaid gowns, We know how valuable your gown is, and for us, caring for your gown extends beyond our doors. 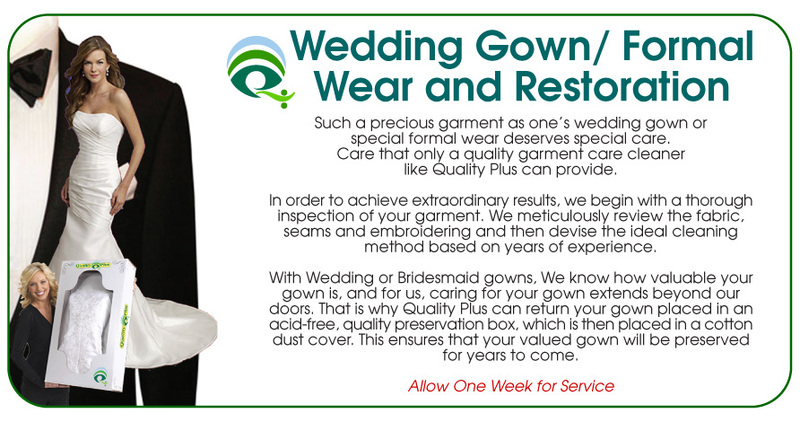 That is why Quality Plus can return your gown placed in an acid-free, quality preservation box, which is then placed in a cotton dust cover. This ensures that your valued gown will be preserved for years to come. 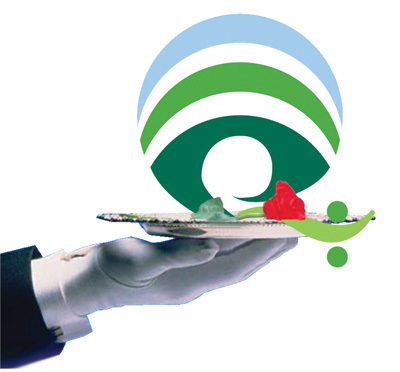 Allow One Week for Service ....................... 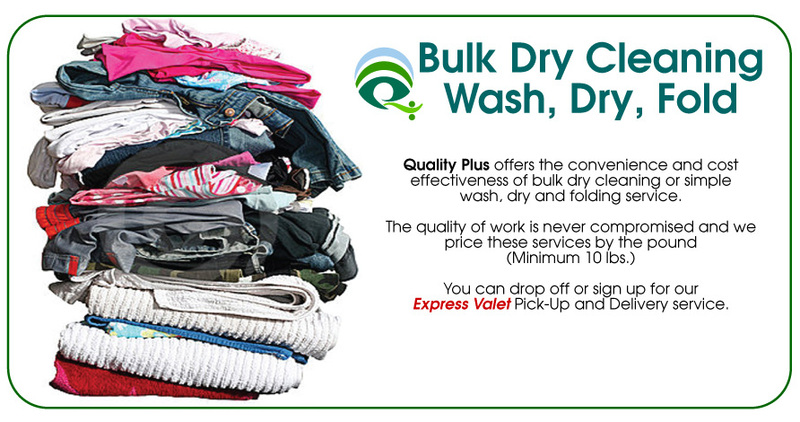 Bulk text: Quality Plus offers the convenience and cost effectiveness of bulk dry cleaning or simple wash, dry and folding service. The quality of work is never compromised and we price these services by the pound (Minimum 10 lbs.) You can drop off or sign up for our Express Valet Pick-Up and Delivery service. ............... 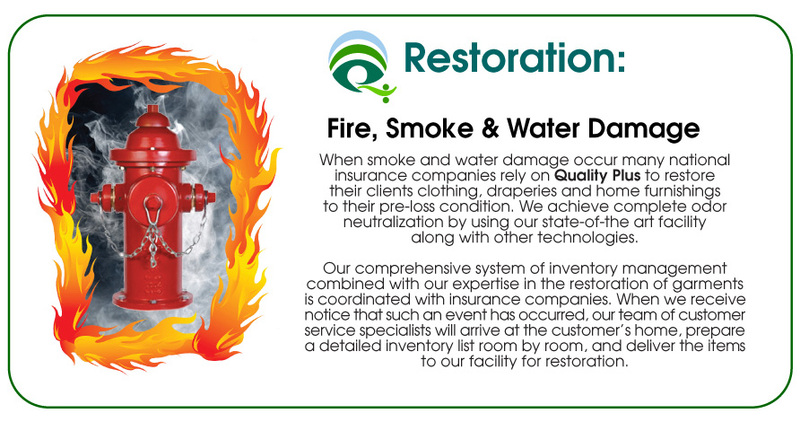 Restoration text: Fire, Smoke & Water Damage When smoke and water damage occur many national insurance companies rely on Quality Plus to restore their clients clothing, draperies and home furnishings to their pre-loss condition. We achieve complete odor neutralization by using our state-of-the art facility along with other technologies. Our comprehensive system of inventory management combined with our expertise in the restoration of garments is coordinated with insurance companies. When we receive notice that such an event has occurred, our team of customer service specialists will arrive at the customer’s home, prepare a detailed inventory list room by room, and deliver the items to our facility for restoration.